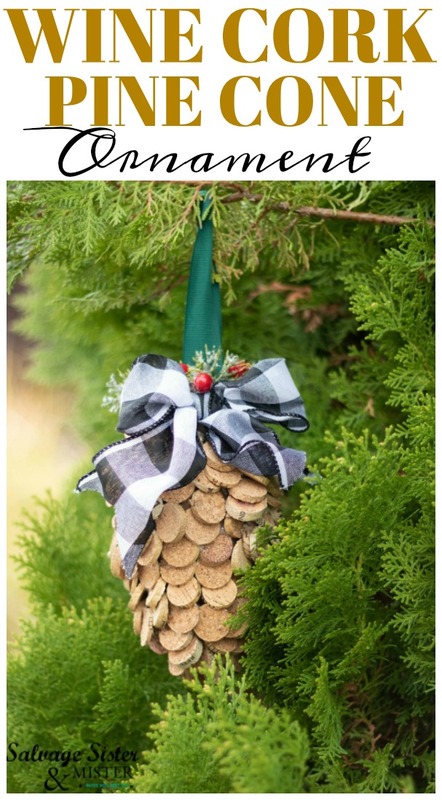 See, we knew you were saving up wine corks to make this fun project…..
*Affiliate links are used. They will show the same or similar items used. You can ready our full disclosure policy here. PINE CONE BASE SHAPE The one here was an actual pine cone base, but The Mister thought a dollar store foam football might work. A foam cut Christmas tree could also be a possibility. Basically, use what you got… that could form that shape. Since this is a pine cone base, it needed to be covered with packing paper so the wine corks could be glued on. HIGHLY RECOMMEND – Finger Tip Protectors!!!!!!!!! Ribbon, two were used here, buffalo check– leftover from this project, and the green was from the packaging on some sheets. Serrated Knife or Small Saw, I would recommend a small tooth serrated knife like this. The larger the tooth on the knife, the more chance for crumbs when cutting your corks. Using a serrated knife, cut the wine corks to your desired thickness. These were done approximately 1/8 to a 1/4 inch. Take your base, and cover/glue, it if necessary. And yes, the irony is not lost on us that we are using a pine cone to make a pine cone. 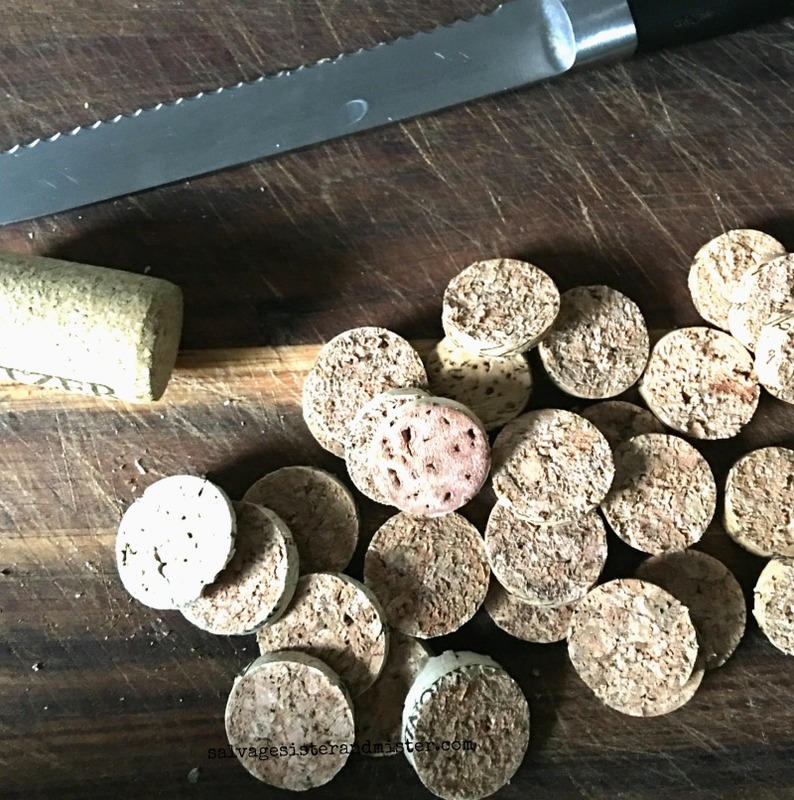 Starting at the bottom, start gluing your cork disks in a layering fashion. Think roofing. AND SERIOUSLY, I can’t even recommend the finger tip protectors enough. Your fingers will thank you…and so will the rest of the house as you won’t be yelling at getting burned every few seconds from applying each disk. After you have worked your way up to the top, make a ribbon hanger. Fold the ribbon in half and glue/pin it to the top. Finally, add any additional greenery and ribbon to the front. 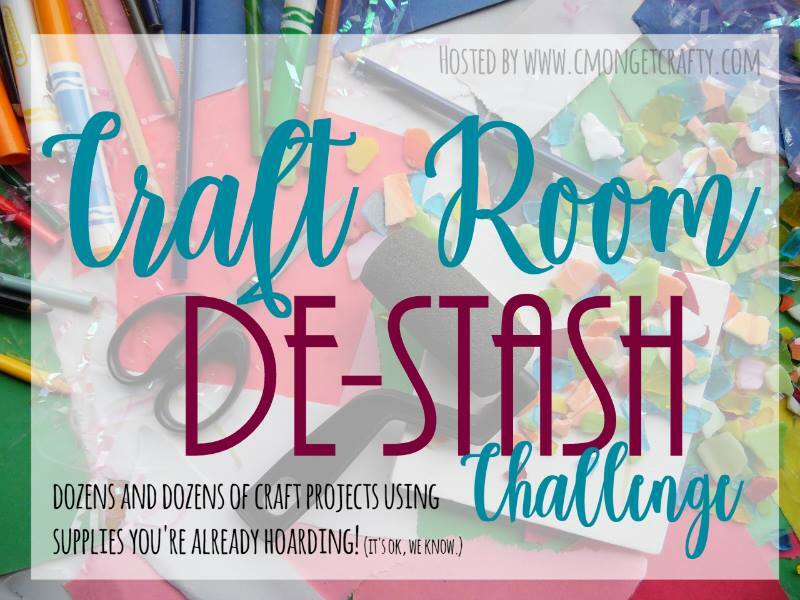 Before you leave, don’t forget to check out all the other de-stash projects. I love it! 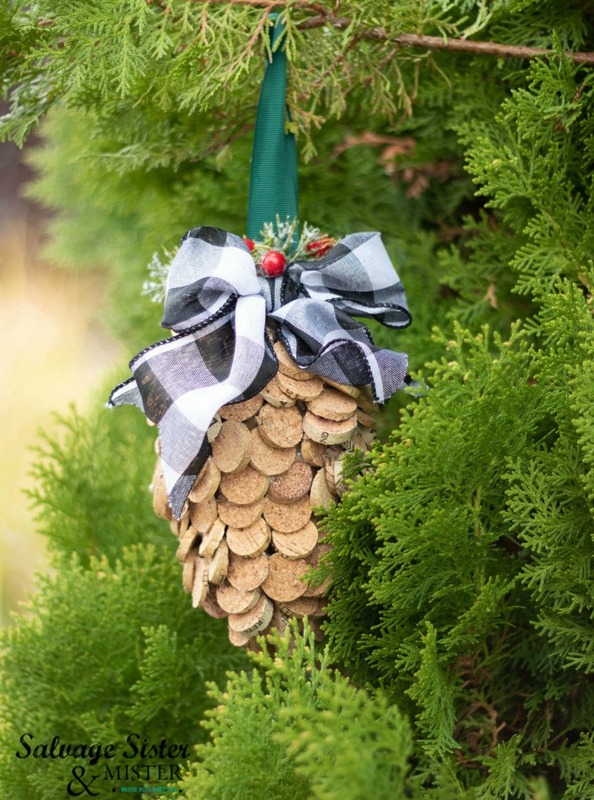 I’m always trying to think of ways to use up those wine corks we save. I’ve done angel ornaments, but that didn’t put much of a dint in the collection of corks we have. This would be great. I like the idea of using a small dollar store ball for the base that your husband had. Pinning and sharing. How awesome to have a collection of corks. An angel sounds cute. Haha! Too funny! Thank you Marci. I love how it turned out. There are so many great ideas of things to make. Very cute! Looks to me like a great reason to drink wine! Haha!Too funny Roseann…that would be a lot of wine. Adorable project. I laughed when I saw that you are using a pine cone to start with. Definitely a new way to showcase a pine cone. Ha! NO kidding. It’s a good thing you can buy the corks in thrift stores. I love this up-cycle. 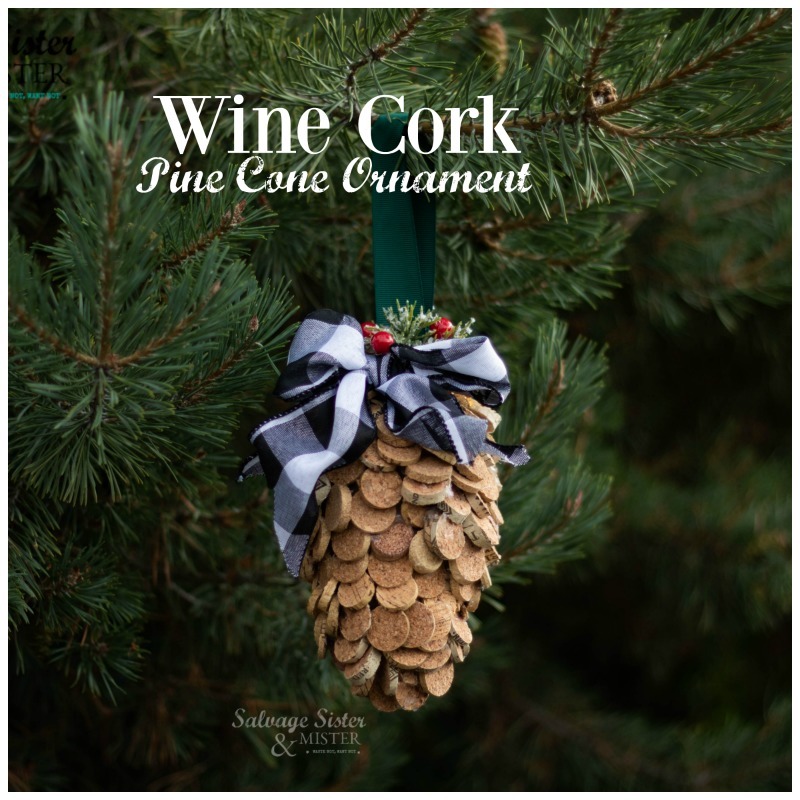 It would make a great gift topper for a bottle of wine!